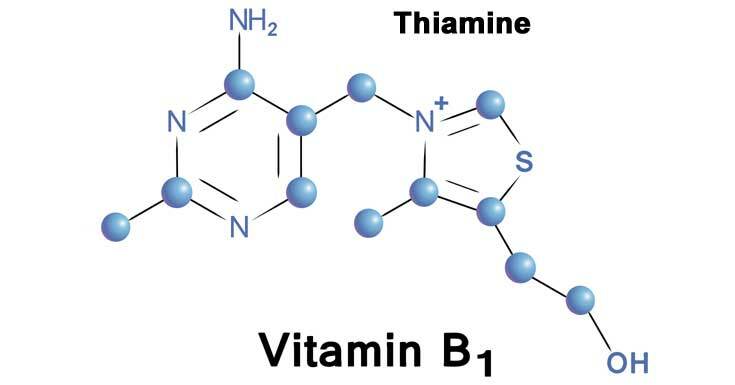 Also known as vitamin B1, thiamine is a water-soluble compound that occurs in different types of foods. Although all organisms use thiamine, it can only be synthesized in plants, bacteria and fungus. You must obtain this essential nutrient from your diet because it cannot be stored in your body. Its supplementation has been used in the treatment of heart disease, brain damage due to aging, eyesight problems and kidney disease among others. Deficiency in vitamin B1 has been linked to health problems including beriberi and Korsakoff’s syndrome. If untreated, depletion of thiamine in the body can be fatal and symptoms may include weight loss, malaise, confusion and irritability. Thiamine comes in trace amounts from a variety of foods including cereal grains, oatmeal, potatoes, flax, rye, kale, cauliflower, eggs, oranges and brown rice. You can also get thiamine from pasta, peas, watermelon, dried milk, seeds, nuts and some legumes. In meat, thiamine can be found in the liver of pork, beef and chicken. Most dietary supplements also contain vitamin B1 along with other essential minerals and nutrients. What are its Possible Health Benefits? Boosts memory: Vitamin B1 has the potential to improve your power of concentration and memory retention. I addition, it’s used in management of nervous disorders like multiple sclerosis. It also enhances mood. Promote digestion and energy production: Thiamine facilitates the breakdown of carbohydrates for energy production. Helps in the maintenance of a healthy heart: Vitamin B1 stimulate production of acetylcholine, a chemical that ensures proper communication between nerves and muscles which is essential in cardiac function. Stimulates production of red blood cells. Lowers the risk of Alzheimer’s disease. What are The Potential Side Effects of Thiamine? Recommended Doses and Timing for Thiamine? Dosage and timing of thiamine depend on a number of factors including age, gender, mode of administration and health condition. If you are an adult experiencing thiamine deficiency in your body, take 5-30 milligrams per day for one month. If the deficiency is severe, consume up to 300 milligrams of vitamin B1 per day. You can prevent cataract by ensuring that you consume 10 milligrams of thiamine every day. Thiamine injection can only be administered by a qualified health care provider in treating and preventing alcohol withdrawal symptoms. The use of thiamine in many dietary supplements is increasingly becoming popular due to the many health benefits associated with this ingredient. It can be difficult to some people to get the recommended doses of thiamine from regular foods. Luckily, supplement manufacturers have come up with special formulations containing Thiamine as a key ingredient to help users fight conditions that may arise due to deficiencies. It’s worth noting that thiamine supplements should not be used to replace prescribed medications or without your doctor’s consent. No thiamine interactions have been reported at this moment. However, it is important to consult with your doctor or a qualified medical practitioner if it will be safe to use thiamine along with other medications. Some medication may affect your body’s ability to absorb and utilize thiamine. Additionally, avoid excessive use of thiamine or any other supplement if you are pregnant, breastfeeding or using prescribed or over-the-counter drugs. Thiamine is an important nutrient required by the body for optimized cellular functions. It can be obtained in trace amounts from regular meals although supplementation can be necessary to some people. Due to its remarkable roles in disease prevention and treatment, Thiamine should be an essential ingredient to look for in any supplement. 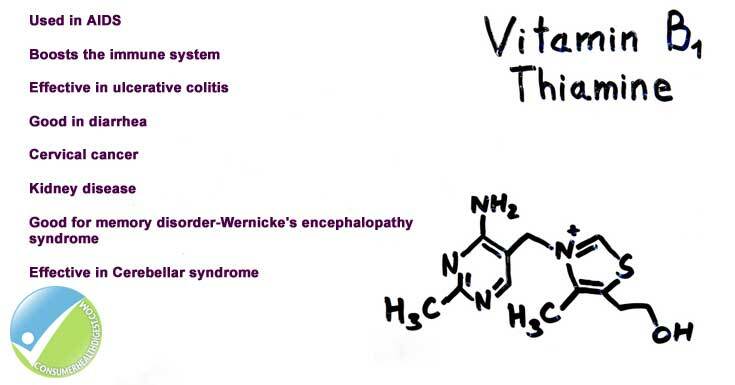 In addition, vitamin B1 has no known adverse side effects when administered in appropriate dosages. Remember to check supplements containing Thiamine and follow manufacturer’s specification in timing and doses. Report any adverse interactions or side effects you may experience to your doctor for further advice.